The summer’s drought has led turtles living in Lake County’s Cuba Marsh to cross the road to get to the other side, where water is a little more plentiful. Photo credit: Daily Herald. Many turtles are crossing roads this summer, moving from dry marshes to those with more water. Many, however, are not surviving the crossing, and the ones that do are causing problems for drivers, particularly along Ela Road, just south of Lake Zurich. In response, the Lake County Department of Transportation and the Lake County Forest Preserves have teamed up to place signs reading “Caution Turtle Crossing” along the road. Lake County Wildlife Biologist Gary Glowacki said to his knowledge this is the first time such signs have been placed along a local road. “We had them specially made for this particular situation,” Glowacki said. Large aquatic snapping turtles and painted turtles make up the majority of those migrating across Ela near Cuba Road, traveling from a dried up wetland on the west side to another wetland on the east where there’s still some water. Although the signs are temporary, Glowacki believes it will attract drivers’ attention so they are aware of the turtles when they use the roadway even after the warnings come down. 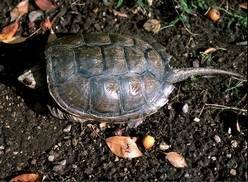 The forest preserves had been fielding numerous calls from the public regarding traffic problems on the road, sometimes caused by drivers swerving to avoid turtles. One of those people helping the turtles is Hoffman Estates resident Mary Hirose, who travels along Ela Road daily. She’s taken to sitting in her car along the side of the road this summer to watch for turtles every day, sometimes for hours at a time. She said she helps an average of six turtles per day. “I sit in the car and just watch, scanning the horizon for a little dark spot along the road,” said Hirose, who has owned pet boxed turtles for over 24 years. On Monday, Hirose attempted to save a giant snapping turtle, believed to to be about 80 years old, which had been hit by a car. She took the turtle to Flint Creek Wildlife Rehabilitation, where the animal was euthanized because of its severely cracked shell. That fence is a “turtle barrier” the forest preserve is installing to divert the turtles away from the road. The turtles will be directed underneath the road through an underground tunnel that will bring them safely to the other side.